Four star recently restored villa. Modern and neat decoration. In the heart of Normandy, you can enjoy the quiet of the countryside while staying close to shops. 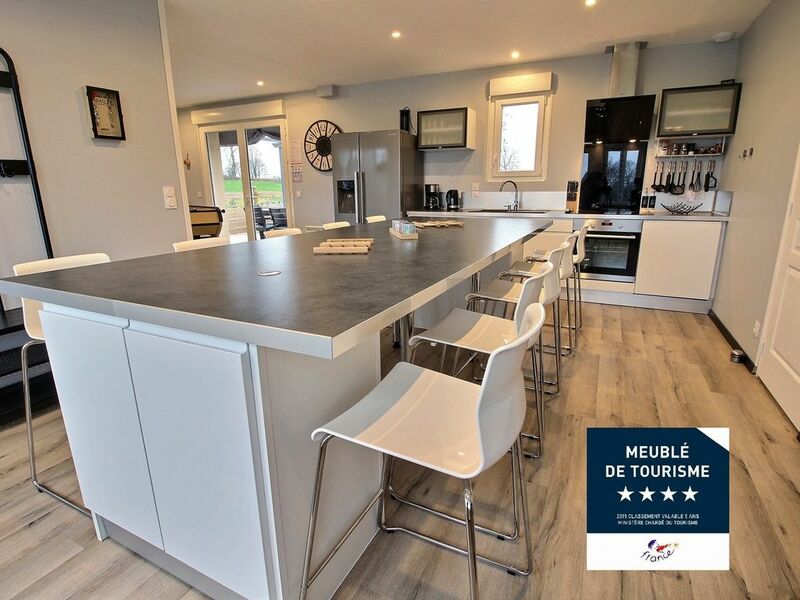 Ideally located The villa is 3 minutes from the A84 motorway (Paris-Rennes), 30 minutes from Granville beach, 45 minutes from Mont Saint Michel, 1 hour from the landing beaches and 3 hours from Paris by train (departure from Villedieu station). Kitchen dining: TV, induction hob, oven, dishwasher, kettle, coffee maker, senseo coffee maker, microwave toaster, food processor and all the necessary cooking and cooking. Lounge: TV, home theater, Playstation 3 with games of all ages, board games, foosball and bluetooth speaker tower. Wardrobe hallway: Iron and ironing board, baby bed, high chair, booster chair, baby toilet gearbox, cleaning kit, sorting, shoe rack. 1st Bedroom: Double bed 160x200, TV, wardrobe, 2 nightstands, alarm clock bright Shower room: Large shower, cabinet, vanity unit, mini bluetooth speaker. 2nd Bedroom: double bed 160x200, single pull-out bed 80x200 convertible 2 persons 160x200, TV, wardrobe, 2 nightstands, coffee table, alarm clock. 3rd Bedroom: 2 pull-out beds 1 person 80x200 convertible into 2 persons 160x200, wardrobe, 2 bedside tables, coffee table, alarm clock light. 4th Bedroom: 2 single beds 80x200, wardrobe, bedside table, small furniture, alarm clock. Bathroom: Large shower, bath, double washbasin cabinet, storage unit, mini Bluetooth speaker. - Pool heated to 28 ° and covered 6m x 4m (May vary depending on the outside temperature -3 ° + 3 °) opening from April 1 to November 15. Empty the fridge-freezer, defrost it, clean it. Put the waste and objects in the containers provided outside. Clean the grill, grill, tongs. By the owner, the day of your arrival.